It's telling that Edward Heath, a shameless liar as well as a spineless administrator, was acutely sensitive of his lower middle class upbringing. His father was a carpenter and his mother a maid, both with Kent accents, which was sufficiently embarrassing for the young Oxford scholar to leave that institution with a very peculiar mode of speech - possessed of 'strangulated' vowels and 'unique' pronunciations brilliantly satirised in a Monty Python sketch. The woman he despised, by contrast, never shirked from drawing attention to her upbringing. For Margaret Thatcher, starting life as the daughter of a Grantham grocer was the source of her relentless work ethic and ambition, as well as a useful tool in demonstrating to the electorate how, unlike those 'not so grand grandees', she knew what it meant to pull oneself up by one's bootstraps - something she was determined to make it easier for others to do. Her successor, John Major, continued this ethos - famously fighting the 1992 general election, atop a soap box, under the banner What does the Conservative party offer a working class kid from Brixton? They made him Prime Minister. The third in what would go on to be a 40-year dynasty of 'grammar school' party leaders, Major was the very epitome of what the post-Thatcher Conservative party stood for - a socially mobile meritocracy based, not on patronage or 'positive discrimination', but on hard graft and ambition. That being the case, there is something particularly reprehensible about shame of lowly beginnings. It is comparable to Sayeeda Warsi chowing down on bacon to prove she isn't a Muslim - to do so would be a tacit admission that there is something fundamentally shameful about her Pakistani background. One ought to be proud of one's roots and it is, to my mind, no lesser folly to be ashamed of humble beginnings as it of ethnicity. But neither do I see a distinction between that and shame of noble blood and privilege. Where Heath was widely mocked for his faux upper class demeanour and rightly despised for the contempt he nursed for common people, 'Call Me Dave' Cameron has been ridiculed for his pathetic attempts to disguise his background of actual privilege. But the fact, demonstrated by Labour's massacring in the Crewe & Nantwich by-election, that the only people prejudiced enough to hold it against him are a minority of very vocal and spiteful leftists appears to have escaped the Prime Minister. These increasingly desperate and altogether confusing attempts to prove to Guardian readers and socialist 'workers' he really is 'one of us' - and certainly not a millionaire cousin of the Queen - are getting beyond a joke. And, while initially refusing even to attend a royal wedding in tails for fear of appearing posh may seem trivially ridiculous, the complex behind it is far more serious. In a Guardian article last week, Alexander Chancellor - himself an Old Etonian - sums up Cameron's thinking perfectly. He said: "If he were going to come across as a new type of compassionate Conservative in sympathy with ordinary people's needs and aspirations, he would have to seem as far as possible like one of them. So he gave up hunting and shooting and his membership of White's Club, and took up cycling and other environmentally friendly pursuits instead." The supreme irony being, of course, that it was the Conservatism of such 'ordinary people' - lower middle class, grammar school educated politicians, like Margaret Thatcher and Norman Tebbit - he has been so desperate to move away from. In seeking to craft a more 'compassionate' Conservative party, he has in fact taken it back to a time when it was led by people just like him - Old Etonians, landowners and aristocrats - the last of which were Harold Macmillan and the 14th Earl of Home in the early 1960s. Margaret Thatcher disposed of such upper class cabinet colleagues very early into her premiership not, as Mr Cameron might have us believe, because their upbringings might make them callous to the concerns of commoners, but because of the very opposite - it made them too 'wet'. By her 1983 election victory, none remained in any positions of great power or influence, with the exception of her deputy, Willie Whitelaw, who became Leader of the House of Lords after his ennoblement to Viscount. She did this because the 'class guilt' of these large landowners prevented them from making the difficult decisions which, while in the longterm interests of the country, would cause a great deal of suffering in the short term. Their privileged upbringing - of never having to work for their positions - made these grandees acutely sensitive to criticism where the lives of 'ordinary people' were concerned and this, together with a sense of noblesse oblige towards the less fortunate, meant they were entirely ineffectual in dealing with the grave crises faced by the country at the beginning of the 1980s - as they had been 10 years earlier under Heath. David Cameron has sought to circumvent this problem (he has, to be fair, been remarkably consistent in his tough economic line) by simply refusing to acknowledge his past in the vain belief that, if he does so, it might simply go away. But guilt is a difficult thing to vanquish and, like a weed, if it is suppressed in one area it invariably arises in another. For Mr Cameron, this has meant pandering to the left in areas of policy outside economics, presumably to somehow 'balance out' what he no doubt feels are the frightful things he has to do to get the country's economy back on track. Consistant with his early rhetoric as leader, he has continued to distance himself from the core values of his party and - until the howls of criticism became too loud - its greatest peacetime prime minister. Of course, when he was elected leader, the left wailed a chorus of 'the Old Etonians are coming', assuming, as only the irrational mind of prejudice would, that a raft of 'anti-poor' and 'reactionary' policies would follow. But, as it happens, we have seen a plethora of socialist policies and proposals spring forth from this tortured conscience - all-women constituency shortlists, gender quotas for boardrooms, the enactment of Labour's Equality Act, compulsory tests for pre-school children and their parents, right down to his truly astonishing admission on Friday (hat tip, Peter Hitchens) that ‘I think we know in 1997 the country needed change' - which sounds very much like a veiled confession to me. Who knows, perhaps history will look kindly on Mr Cameron. Like John Major, he may well come to be regarded as a man who, despite the odds, managed to bridge, not only two warring sides of his own party, but a coalition government, all the while navigating the country through a severe economic downturn and - perhaps - securing a second term at the polls. I sincerely hope this is the case and do not doubt the Prime Minister is up to the job. Where I have my doubts, however, is the state his guilty conscience will leave this country in - if not economically, then socially - when that second or third term expires. I also wonder what sort of example he is setting the country when it comes to pride in one's heritage. 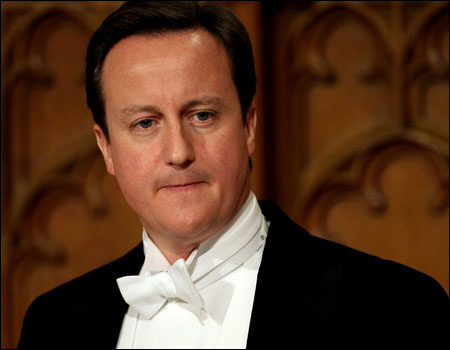 Everyone knows you're posh, Dave, and, other than a few bile-filled lefties, nobody cares. So stand proud in that tailcoat at the royal wedding - chat to the Queen about how great it is you're both related to William IV. Just stop pretending you're something you're not.